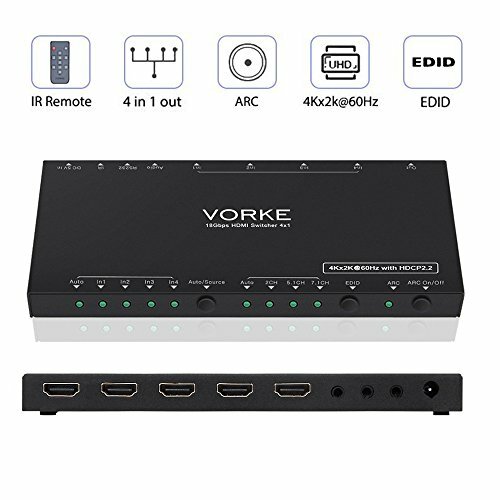 Vorke HD41 Pro HDMI switcher is a fantastic device with reliable and solid build. Simply plug in your devices and then connect the box to the TV, game console or projector, etc. HDMI-enabled devices. The HDMI switcher will recognize when a product is turned on and automatically switch to the correct input. ★Supports up to 4K@60Hz( (4:4:4) for crisp, clean and powerful display(RGB and 3D features are also supported).Supports PCM, Dolby ATOMS, Dolby True HD, DTS-HD Master Audio up to 7.1CH. Digital and analog Audio output. ★Connects up to 4 HDMI source components to a single HDMI input for seamless transitions between gaming, television and more. ★Remotely control your HDMI switch with the included IR remote while being in the comfort of your couch. ★Plug and Play. Works perfectly with HDMI devices like 4K TV, projector, HDMI LCD, TV box, Blu-ray player, DVD player, PC,STB, XBOX one s,PS4 PRO etc. ★ARC feature allows for transmitting sound from your TV back to your surround sound system, which eliminates the need for a separate S/PDIF connection. Warm Notice： To make sure remote can work properly，please kindly plug the IR cable on the IR PORT. If you have any questions about this product by VORKE, contact us by completing and submitting the form below. If you are looking for a specif part number, please include it with your message.